Sphero is a robotic ball that you can drive around with your smartphone. It’s a lot fun, and we’ve been especially impressed with the way that you can get down into its software and mess with it, changing it from a relatively simple remote controlled toy into a real autonomous robot. Heck, you can even control it with ROS. A quick rundown on the Sphero if you’re not familiar: it’s a roughly softball-sized plastic sphere with a clever system inside that it uses to drive itself around without having to rely on any external motors or controls. It kinda looks a little bit like magic, but it helps to think of it just like there’s a little remote control car in there that drives, spinning the outside shell to move. Your interface with Sphero through the Bluetooth connection on your smartphone, and it’s got a nifty little induction charging cradle to keep it powered. The new Sphero (officially called Sphero 2.0) looks much the same as the original one, largely because it kind of has to be a sphere to work, limiting external design changes. It’s not totally featureless, and includes some subtle and rather pleasing textured lines across its surface. The real changes are inside, in both hardware and software. The flagship new feature, and we may have subtly alluded to this, is that Sphero 2.0 is 2.0x as fast as Sphero 1.0. The original Sphero was lively enough, but this new one is intimidatingly fast, with a maximum speed of well over two meters per second. Inside, there’s a bigger and more powerful motor, fancy new firmware, and the center of gravity has been lowered substantially. Realistically, when you’re starting out, this makes the robot nearly uncontrollable, which is why when you start with Sphero out of the box, the speed is cranked down a whole bunch. Unlocking Sphero’s top speed involves progressing through a series of driving challenges, which sounds annoying, except that you really do need the practice before you’re qualified to unleash that full two meters per second anyway. Once you’re there, however, you can send Sphero off of jumps and stuff (included in the box) and it actually manages to catch a respectable amount of air. Sphero’s biggest issue when it comes to driving is that by definition it doesn’t have a lot of traction, so it has issues accelerating and steering on wood and tile floors. Also, no matter how talented of a driver you are, you’re gonna crash into things. Badly. Over and over. Orbotix is selling a “nubby cover,” which is a rubber jacket of sorts that you can tuck Sphero into, giving it additional traction and some shock absorbing capabilities. It also makes it easier to drive Sphero on water, because you can do that: it’s waterproof. The other hardware update on Sphero 2.0 is a new set of RGB LEDs that makes it extra-glowy. It’s three times brighter (think daylight visible), and you can set them to any color you like using an app. It’s not only pretty, but also has lots of interaction potential. Potential, really, is what we like most about Sphero. Because you can record and play back macros, and then look at the code that those macros create and modify it, Sphero provides a great way to get introduced to simple programming. And with ROS integration, you can go on to get as complicated as you want. But even if you forget all that, it’s still a fun little toy, and the 25 apps and games that it comes with should help keep it interesting long-term. This entry was posted in Mobile, Robotics and tagged Sphero V2.0 on August 15, 2013 by enddl22. NASA may not be sending up manned shuttles anymore, but that doesn’t mean we’re done exploring the solar system — not by a long shot. On August 5, the space agency’s new flagship rover is expected to land on Mars as part of an unprecedented search for traces of life on the Red Planet. 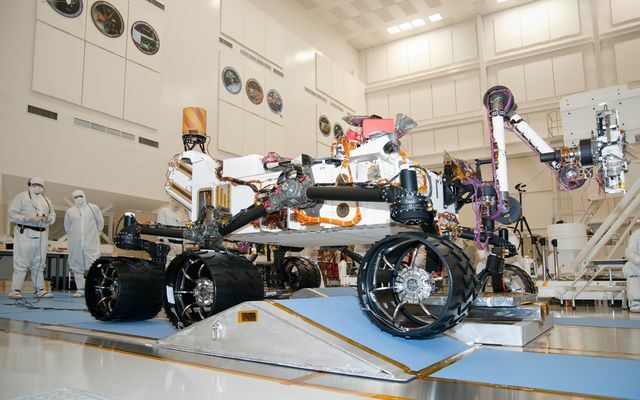 You can ascertain the rover’s importance simply by its size. This thing is huge compared to NASA’s previous explorers, Spirit and Opportunity. Curiosity measures 3m long, 2.7m wide, and 2.1m tall — taller than the average NBA centre — weighing a hefty 907kg. NASA’s previous pair weighed just 185kg apiece. Tack on the added reach of Curiosity‘s 2.1m long manipulation arm and the rover has roughly a two-storey vertical reach. Not that there are many two-storey-tall objects around the rover’s planned landing site but a good ability to have, nonetheless. 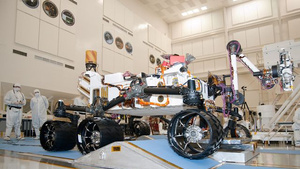 To move beyond wherever it comes to rest after being lowered via sky crane from the Mars Lander Engine, Curiosity will rely on a set of six oversized wheels attached to a rocker-bogie suspension, much like its predecessors. 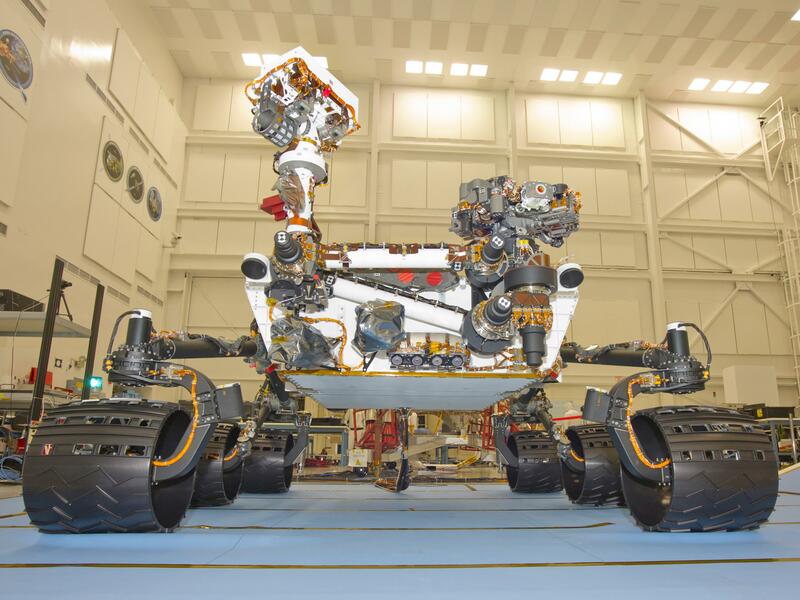 Fun fact: the wheel treads will leave an impression in the Martian soil spelling “JPL” in Morse code. Why? Who cares, it’s cool. The rover will propel itself along at up to a relatively-swift 91 metres per hour in automatic drive with an average speed of just 30 metres per hour when hunting for signs of life. In all, this $US2.5 billion program is going to traverse just 19.3km during its two-year stay on Mars. Powering the scientific behemoth is some surprisingly old tech. 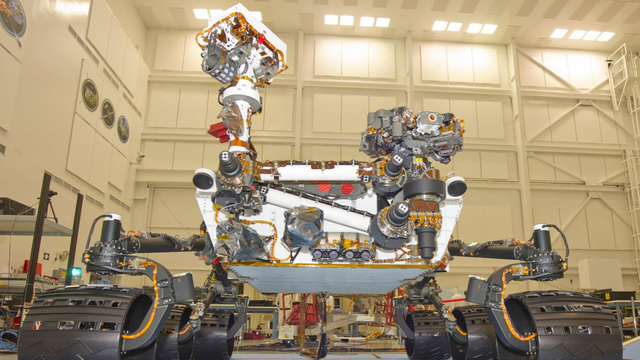 Curiosity relies on a radioisotope thermoelectric generator (RTG) — the same nuclear engine that powered the Viking Spacecrafts from the 1970s — but hey, you stick with what works. These engines generate an electrical charge from the heat created by the 4.5kg power cell’s decay of plutonium-238 — 125W of electrical power at the start of the mission decreasing to about 100W at the end of the plutonium’s 14-year life span. 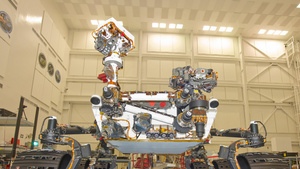 That heat is also employed to keep the rover’s fluids and mechanisms from freezing during the cold Martian nights. You could even say that NASA’s built itself a warm-blooded robot. 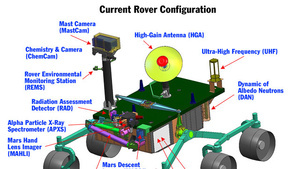 Beyond keeping the rover itself alive, the RTG system will power the machine’s extensive suite of sensors, X-Band transmitter, UHF radio, a pair of onboard computers — each with 256KB of EEPROM, 256MB of DRAM, and 2GB of flash — and an Inertial Measurement Unit (IMU) that helps the rover keep track of its bearings and balance with 3-axis sensor input. And gadgets. Hooo boy, does it have gadgets. The Rover boasts a trio of primary cameras: the 720p multi-spectrum Matcam, the Mars Hand Lens Imager which is attached to the arm and capable of taking 1600 x 1200 microscopic shots, and the Mars Descent Imager, which will snap five frames/second for about two minutes as the rover makes its final approach to the surface. It also sports four hazard-avoidance cameras and a pair of stereoscopic navigation cameras. 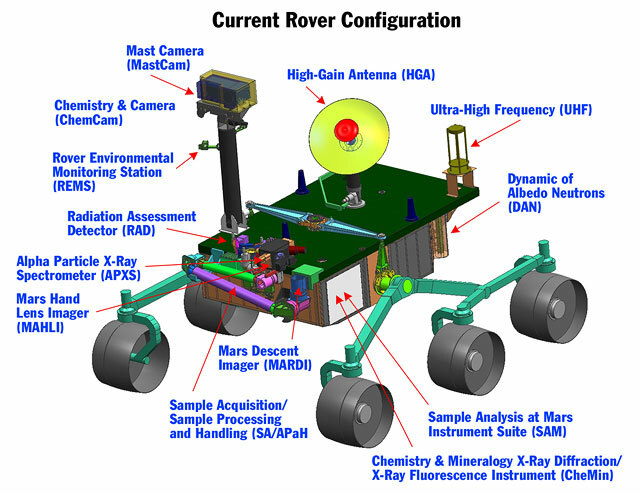 This entry was posted in Mobile, Robotics and tagged Curioey, NASA, Rover on May 28, 2012 by enddl22. I don’t know what it is that Swarmanoid actually does with the books that it steals, but the robot (or, a piece of the robot) has been pilfering them since back in 2009. At least stealing books is better than stealing kids, which is what Swarmanoid’s predecessor did to keep itself busy. It’s tough to call Swarmanoid a robot (singular), since it’s made up of a swarm of dozens of separate robots, but it’s equally tough to think of it as separate robots, since the individual members of the swarm depend on each other so heavily. Putting grammar aside, the Swarmanoid swarm consists of three discrete types of robots, all of which we’ve been introduced to before: Foot-Bots can grab onto other robots and move horizontally. Hand-Bots have manipulators and a freakin’ sweet magnetic grappling hook that lets them move vertically. And Eye-Bots can fly, perch on ceilings, and direct the movements of the Hand-Bots and Foot-Bots with their cameras. While trying to manage so many robots all at once may seem needlessly complicated, a swarm of robots has all kinds of advantages: swarms are adaptable, scalable, resilient, cost effective, and very efficient at any task that involves being in more than one place at once, like search and rescue (or search and steal). There are downsides, too, like having to recharge each and every one of these little guys, but with some epic amounts of cleverness by robotics researchers, robot swarms are getting to the point where they’re able to pretty much take care of themselves, and after that, the sky’s the limit. Unless you have an Eye-bot, in which case it isn’t. This entry was posted in Mobile, Robotics and tagged EPFL, robot, Swarm on August 16, 2011 by enddl22.